The name refers to Sengo Muramasa (千子村正), a famous swordsmith in 14th century Japan. The katana of his school were said to thirst for blood, and drive their wielders to murder and even suicide. There is a tale that once drawn, a Muramasa blade had to draw blood before it can be sheathed again, even if the blood was that of the wielder. The Muramasa school of blades came to an end when shogun Tokugawa Ieyasu came to rule. It is said he had lost so many friends and relatives to the blades that he forbade their use everywhere. 村正 / ムラマサ [muramasa] in Japanese. Ability: Chain Bonus Lv 1, Accessory Ability Group: ? 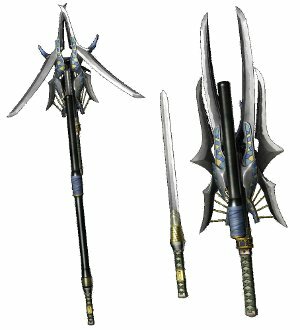 Description: Referred to as a demon sword, this katana was said to drink the blood of countless enemies. Type: Katana, Element: Dark, Growth: ?, Cost: ?